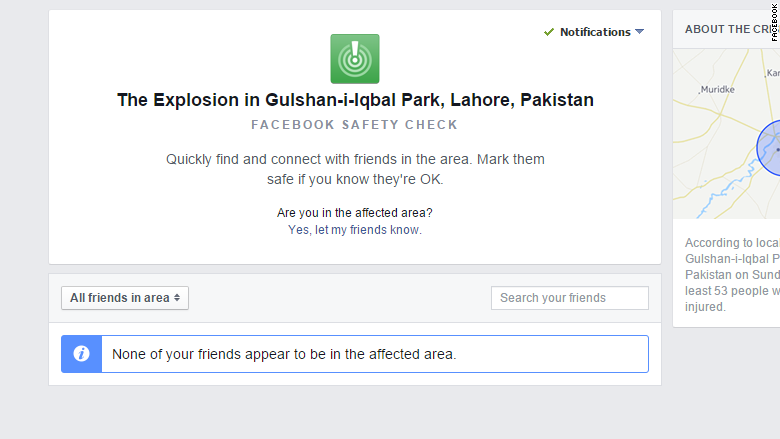 Facebook activated its Safety Check after a suicide bomber in Pakistan left scores dead. But the feature malfunctioned, prompting users thousands of miles from the blast to tell friends they were safe. Social media was flooded with confused Facebook users who'd received a notification Sunday morning reading: "Are you OK? It looks like you're in the area affected by The Explosion in Gulshan-i-Iqbal Park, Lahore, Pakistan. Let your friends know that you're safe." It was unclear how widespread the issue was, although it appeared to primarily affect users in the U.S. and UK. "Unfortunately, many people not affected by the crisis [in Pakistan] received a notification asking if they were OK," a Facebook statement read. "This kind of bug is counter to the product's intent." Facebook said it had "worked quickly to resolve the issue." Facebook (FB) first launched its Safety Check feature in 2014 for people to mark themselves or others as "Safe," "Not in the area," or "Unsafe" following natural disasters. The terrorist attacks in Paris last November were the first time the feature was used after a man-made disaster. Facebook says it's still testing the feature for that use. In recent months, the feature was activated during floods in Chennai, earthquakes in northeast India and southern Taiwan, and terrorist attacks in Nigeria and Turkey. It was also launched after the terrorist attacks in Brussels last week. Facebook says that in 2015 more than 950 million people received a notification that a friend was safe.